A road to nowhere or taking the long way round? The singlemost admirable feature of Formula-E for me is their understanding that the format of their series needs to evolve over time. Engratiating themselves to fans, teams, manufacturers and the cities they run around for the years to come. Formula One in comparison feels like a rudder-less ship, with too many crew members, all of which have their own roles to fulfill but are more interested in doing someone else's. Where Formula One lacks the maverick thinking it once possessed in Bernie Ecclestone's high days, Formula-E has Alejandro Agag at the helm, fashioning a sport that is both captivating (at points), whilst striking a synergy with the electric road cars of the future. Power has been increased from 150kw's to 170kw's in season two, which means the drivers and teams have to be particularly clever in managing energy to make their stint length, as although energy can be recovered, perhaps moreso by some depending on their powertrain selection, they still need to swap cars mid race. This was perhaps one of the most important aspects of Piquet Jnr's maiden victory with the Brazilian often able to conserve more energy in the first car, giving him more energy to deploy in the second. He seemed to find a canny way to know the aero sweetspot for the car, whereby deploying more energy on the straight was simply irrelevant. It's a shame for Piquet Jnr that his team went down the twin motor route as his competitiveness in 2016 has been hampered by a powertrain around 40kg's heavier than some of the other teams. DS Virgin Racing have been hit with the same issues, albeit not quite to the same degree with their system a little lighter than NEXTEV TCR's. Although Citroen who are using their DS branding in the series will likely get on top of the issues they've faced this year. It is the two road car manufacturer backed teams that have made the biggest leap with Renault e.Dams employing a two gear arrangement, however, the first gear is simply for starts giving them maximum deployment off the line. A simple cable operated manual shifter is mounted in the cockpit to enable Buemi and Prost to shift into their race gear. Meanwhile, ABT's affiliation with both Schaeffler has been instrumental in their challenge for the title too, whilst their loose connection with Audi/VW seems nothing more than a marketing exercise at present. Mahindra have refined season one's powertrain offering, with an updated version of McLaren's motor in use, whilst a Hewland 4 speed gearbox is used rather than the original five speed. As the season has matured the team seem to have really got on top of their setup, maximizing their performance, albeit not to the level of the championship elect. 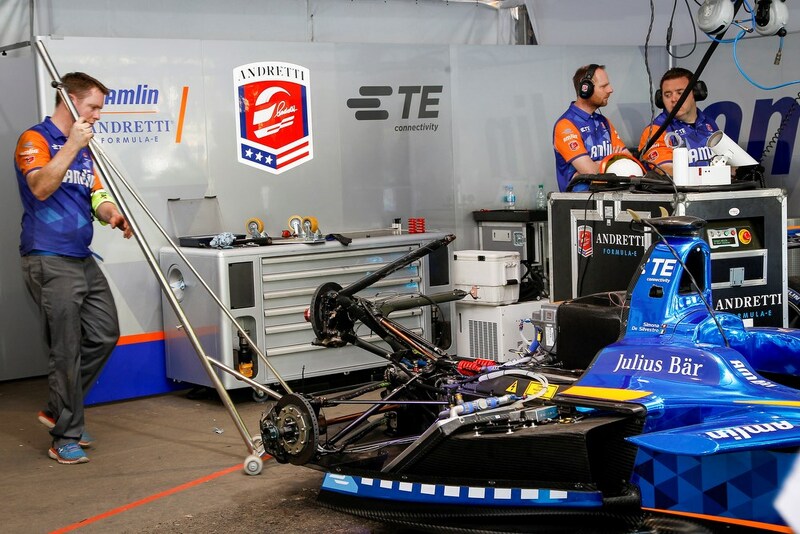 Having initially looked at using their own powertrain for season two, Andretti suffered insurmountable issues in pre-season testing that prompted a return to season one's tech. Team Aguri, made the same decision, albeit they never planned to run a different configuration. Team Aguri have impressed, especially in the hands of Da Costa who has some bad luck along the way too. Michelin have announced that they'll be supplying a new tyre for season three, with the French manufacturer making changes to their offering to improve performance early in their life cycle without having a major impact on their longevity. The tyres have already been put through their paces by Renault e.Dams ahead of their use by everyone next season and will not only be lighter but retain their all conditions makeup. Having lost the Trulli team early in the season a new competitor has already been lined up for season 3 with Jaguar taking their place in a partnership Williams Advanced Engineering, who supply the battery packs for Formula-E. Meanwhile, it appears that other road car manufacturers want in with both Nissan and BMW making their interest known, whether it'll be in season three or beyond we'll have to wait and see. The biggest hurdle for most of the road car manufacturers is that Formula-E is currently an advert for range anxiety but, the FIA and the series itself are keen to get rid of the two car format, with season 5 the line in the sand, although many would like to see it happen sooner. Again, this shows that as a sport their 'roadmap' helps everyone to understand the direction that they're heading, like it or not. One of the pivotal decisions taken when establishing the electric series was that inner city road circuits would be used, rather than proper race tracks. So far this has been a success with some minor but notable failures, such as season one's abandoned airport in Berlin, which was thankfully switched for a city centre location this year. The calendar for season three has recently been announced and whilst there are some notable absentee's, London's Battersea Park perhaps the most (local residents have campaigned to have the race banned) a keystone race that has been placed at the end of the calendar will have many excited. Breaking North America would be a big deal for the series and although Long Beach remains on the calendar the addition of New York is something even Formula One has failed to accomplish so far, even after several attempts. Two rounds at a re-jigged Port Imperial Street Circuit (Formula One's last attempt at having Manhattan as the background to a race was here too) would be dovetailed with two rounds in Montreal too. This article is a sponsored piece and I'd encourage you to check out: Formula-E Highlights, which offers a different perspective on the series so far.